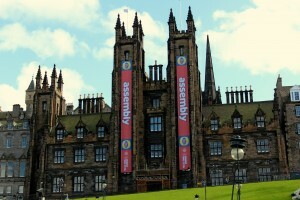 Last friday my family and I arrived in Edinburgh. We were exhausted from the trip (traveling with a 7-month-old is tiring), and to be honest, a bit overwhelmed as we had to prolong our sleep drought to go purchase some necessities. At the airport, we were pleased to meet our taxi driver, a Polish man who met his Polish wife in the US, lived in Chicago for a time, but then chose Edinburgh to settle because he was “looking for a nice European city.” He gave us lots of tips and provided a sort of mini tour along the way. Saturday we began to feel a bit more on top of things after some rest and a nice walk around the city. It helps that we have had the sun shining much of the time. Sunday we were initiated as bus riders and traveled across city centre to have a meal and watch some fireworks with a fellow New College family. We were thankful for their hospitality. Our view was spectacular, as well, as we sat on a hillside looking south across a small lake (could it be described as a loch?) at the castle from which the fireworks were set off. Monday we walked south from our apartment to visit what in the States we would call a mall, and we saw some nice shops along the way we’ll have to visit another day. Later in the day I walked to New College–a walk I’ll be taking about 5 days a week–and met with my advisor, Paul Foster. 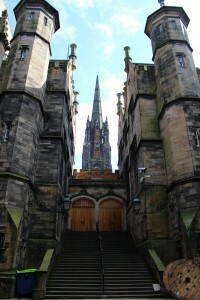 He kindly made sure I had what I needed in Edinburgh and then showed me around New College. We ended our visit in the library which I’m excited to explore further. About that walk… From what I can tell, my walk to New College is very reasonable by UK standards, though in the Midwest US, we would seldom walk this distance regularly. It takes me about 30 minutes each way (1.7 miles, I think). Can anyone say shoes for Christmas? If you’re interested in more of this kind of information, a nice place to visit would be our family blog: manntribe.com (to be updated soon!). Here at the Sake of Truth blog, I’ll try to stay a bit more ‘on topic’. Excited to read this post. Hoping for many more!! Enjoy your new adventure in life, looks incredible there. I’ve visited Edeinburgh in the past and long to come back sometime. We are going to spend a week in Dublin the 1st of October. Enjoy your stay and your studies. What an opportunity! Very nice! Let me know if you venture over to Edinburgh!